"Another Period" returns to Comedy Central this week. The show is set in Newport, Rhode Island and follows the lives of the Bellacourt sisters at the turn of the 20th century. The format of the show follows the familiar and popular structure of reality tv. It's sort of like "Keeping up with the Kardashians" meets "Downton Abbey." They do what a lot of aristocrats did back then, which is nothing, basically. The show was co-created by Natasha Leggero and Riki Lindhome, they play Lillian and Beatrice Bellacourt respectively. The sisters have a particular obsession with fame and go to great lengths to stir drama and obtain as much stardom as one could in the gilded age. "Real-life" characters often get tangled in the Bellacourts lives like Sigmund Freud and Mark Twain. In one episode, they enlist the help of Harriet Tubman for a lesson on marketing their image. Another episode, sees the sisters get in a literal fist fight with Helen Keller. The show is over the top, subversive, weird and chock full of absinthe references! Jesse sat down with Natasha Leggero and Riki Lindhome to talk about embedding history into the show, the guilty pleasures of reality tv, and the time they were guests on the Today Show with a very drunk Celine Dion. Click here to listen to Natasha Leggero and Riki Lindhome's interview on YouTube! Greg Broussard better known as Egyptian Lover got his start as a DJ for Uncle Jamm's Army, a hip-hop crew based in Los Angeles. In 1984, Uncle Jamm's Army released a 12 inch single via Freak Beat Records. On Side A of that single was: "Dial A Freak." and Side B was : "Yes Yes Yes." Both tracks were produced by Egyptian Lover. The tracks received a lot of local play at huge parties thrown by Uncle Jamm's Army. At one point the venues they were filling up included the Hollywood Palladium and the Los Angeles Sports Arena. 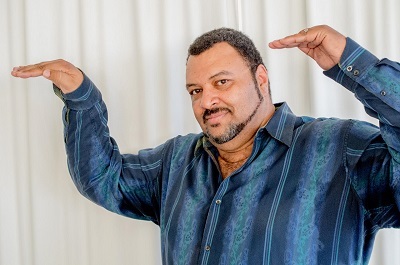 As a solo artist Egyptian Lover has released nine albums, mixing Kraftwerk, Prince, a little bit of G-Funk every now and then, too. His latest, "1984" was released in 2015 on his label Egyptian Empire Records "1984." The official music video for the track "Killin' It" is insane. It reminds us of that Treehouse of Horror episode where Homer gets sucked into the 3rd dimension, and he says everything looks like the movie Tron. But instead Egyptian Lover transports us to his version the 80s -- a total throwback to the aesthetic of the decade, with glossy computer graphics, rectangular prisms, polished sports cars and all! Jesse talks with the Egyptian Lover about the most iconic instrument in hip-hop: the Roland TR 808, and how the group Kraftwerk helped him meet his wife. For Egyptian Lover's Spring tour dates click here. Click here to listen to Egyptian Lover's interview on YouTube! 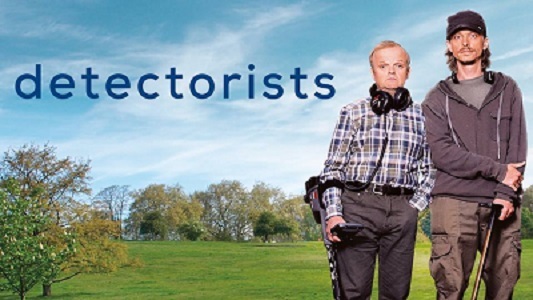 Finally, for this week's Outshot: television show "Detectorists." It's about a pair of guys with metal detectors, wandering through the English countryside looking for gold. While they don't exactly find the treasures they're looking for they do find out something more meaningful about themselves in the process. Click here to listen to Jesse's Outshot on YouTube!